They are designed to be creative and informal, with ways for everyone to get involved, whether you are a daily dog walker or occasional sunbather! The workshops are held at Exchange House, 231 George Street, Glasgow, G1 1RX. The workshops are all free to attend and you are welcome to attend as many as you wish. There will be light catering served at each workshop and children are welcome. Although each workshop is themed, they are all relevant for all park users. If you would like to attend, and have not already done so, please RSVP to Anna Raymond, Project Coordinator via anna@pidginperfect.com and include which workshops you would like to attend. If you are unsure whether or not you will be able to make it, please RSVP anyway. 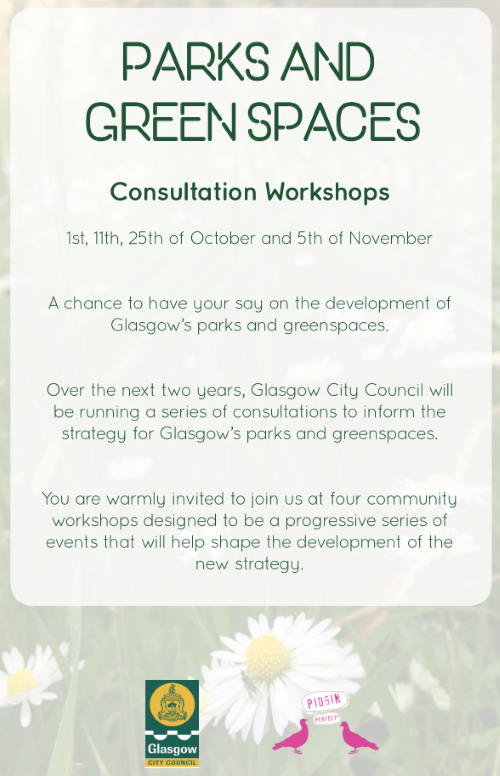 If you have any questions about the workshops or the consultation process, please feel free to get in touch.